There’s no better sign of the progressiveness of a cappella than the steady stream of covers devoted to House Music. Call it House, EDM, electronic, or whatever, it’s all good and is the latest trend in our fabled genre. From unorthodox vocal tricks and detailed sound production to innovative arranging, groups can make a fairly strong case as to why this type of music should be included in their yearly repertoire. Not to mention that it takes artistry to an entirely new level as the genre often pulls from various song styles and influences. In today's Top 5, House Music is in abundance as we note five of our favorite covers from the genre, with each video being released from the last two years. Some are effect-heavy and oozing with production, while others offer a more stripped-down take on popular radio hits. In any case, all give an idea of where the future of our art is headed. I'm convinced that even without amplification this cover of "How Deep Is Your Love" would still be truly impressive as Astha A Cappella's sound is so clean, vibrant, and easy to move to, no easy feat when dealing in House Music. And this soloist needs to drop a single, like right now! State of Fifths wins on two ends: being able to produce both a killer studio recording and an exciting music video. Speaking specifically on the vocals, the groove is so laid back and in the group's pocket that we're convinced that State of Fifths double as undercover DJs outside of classes. We're no experts on House or EDM, so excuse us if we're breaking a cardinal rule by stating that the Treble Makers just make music seem fun. It could be the light tone to the group's voices or the group's way of not taking themselves too seriously with this video that is making us proclaim the previous statement. Whatever it is, they're bringing a fresh take to the genre that makes us want to keep listening. One reason we like House Music is due in part to the way it can easily incorporate so many styles. With elements of rock and southern hip-hop, the Saxatones are straight fire as they drop aca-bombs with this cover of "Hey Mama." 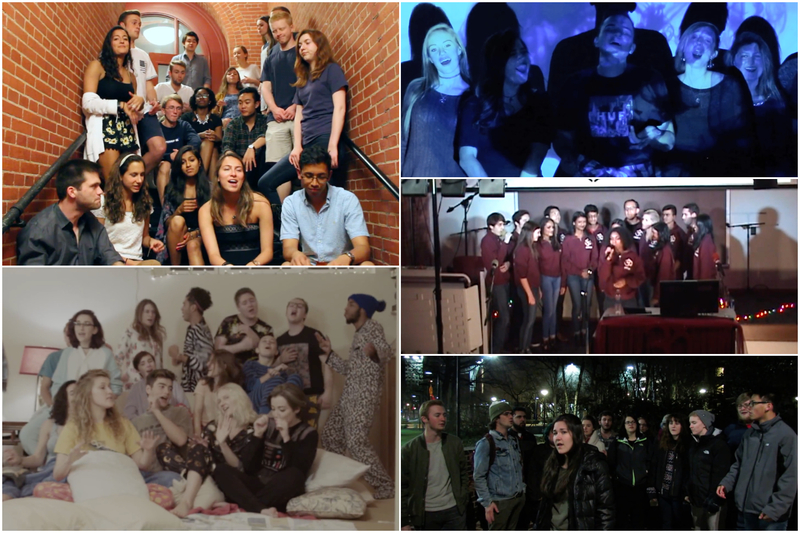 Stripped-down a cappella often provides some of the best musical moments. Couple that with a House song that has its roots in heavy production and effects, and the experience is even more exhilarating. This is why this cover by Pitch, Please works on so many levels.